The Kennedy Patriarch by Nasaw – Joyce's mystery and fiction book reviews with some non-fiction too! I recently reviewed the novel, The Kennedy Debutante, which I felt was a very good historical novel. 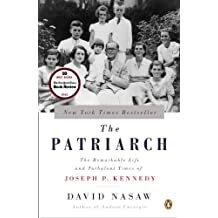 Today a biography of Joseph Kennedy, The Patriarch, is an e-book bargain. I just purchased it and look forward to learning more about this driven man. I need to see if this one is still a bargain. Thanks for sharing, Joyce. If you haven’t read it, there’s a fantastic nonfiction title about Rosemary. I listened to it on audio just before reading Kick’s story in The Kennedy Debutante. Thanks. I will look for it. Years ago I read The Fitzgeralds and The Kennedys which was also excellent. I was able to scoop this one up on sale still. I will look for The Fitzgeralds and The Kennedys, too!